Want to be notified of new releases in booksbyus/zguide? Written by Pieter Hintjens ph@imatix.com, CEO iMatix Corporation. A ØMQ socket is what you get when you take a normal TCP socket, inject it with a mix of radioactive isotopes stolen from a secret Soviet atomic research project, bombard it with 1950-era cosmic rays, and put it into the hands of a drug-addled comic book author with a badly-disguised fetish for bulging muscles clad in spandex. Yes, ØMQ sockets are the world-saving superheros of the networking world. The text of "ØMQ - The Guide" is copyright (c) 2009-2012 Pieter Hintjens, and is licensed under the Creative Commons Attribution-Share Alike 3.0 License. The source code examples are licensed under MIT/X11 unless otherwise specified in the code. The tools in /bin are placed into the public domain. 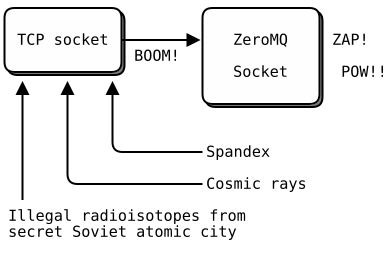 All contributions to the Guide example source code is governed by the C4 process. Thanks to all the contributors, listed in CONTRIBUTORS.